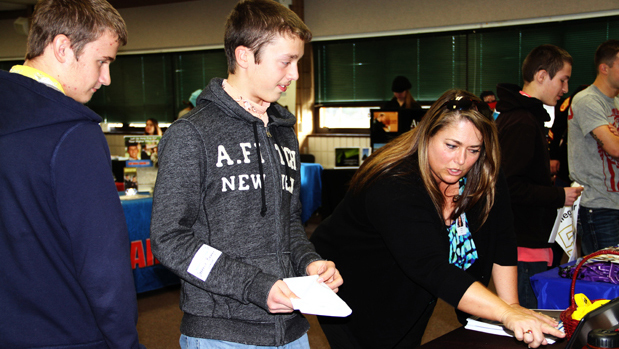 Kenai Peninsula teens from all points in the district arrived at the Soldotna Regional Sports Complex to ask questions, and explore options at the sixth annual Kenai Peninsula College Fair on October 20, 2015. KPBSD schools sent junior and senior high school students to this event armed with questions and support from their school counselors. Students from local homeschooling programs and private schools were invited to come as well. Representatives from KPBSD and KPC were also there to assist with financial aid questions and scholarship information. 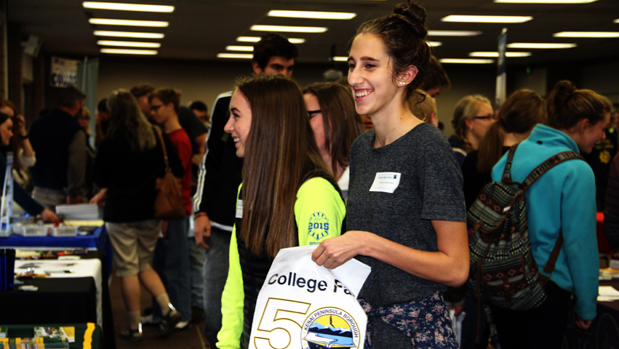 Students gathered in the halls to talk and share what they learned with each other, before beginning the journey back to their home towns—whether that was Seward, or Razdolna, Kachemak-Selo, Voznesenka, Nikolaevsk, the Homer area, or closer to the college fair location at the Soldotna Sports Center. Living in Alaska, along with the cost of travel, can often make college visits difficult for prospective college students. 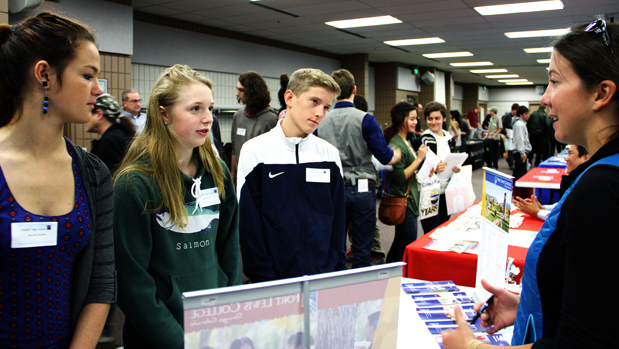 The KPBSD College and Career Fair brings students together with college and career and technical institutional representatives to meet face-to-face in one convenient location. Thank you to the organizers, institutions, and counselors who make this annual event possible for KPBSD students. Educational institutions included: Alaska Bible College, Alaska Christian College, Alaska Commission on Postsecondary Education, Alaska Job Corps OA/CTS, Alaska Pacific University, AVTEC – Alaska’s Institute of Technology, California Baptist University, Central Washington University, College of Saint Benedict/Saint John’s University, Colorado Mesa University, Colorado State University, Eastern Washington University, Embry-Riddle Aeronautical University, Fort Lewis College, Gustavus Adolphus College, Idaho State University, Institute of American Indian Arts, Kenai Peninsula College, Lincoln College of Technology, Linfield College, Mayville State University, Northern Arizona University, Northern Industrial Training, Oregon Coast Culinary Institute, Oregon Institute of Technology, Pacific Lutheran University, South Dakota State University, Southern Oregon University, Southwestern Oregon University, St. Olaf College, The Art Institutes, The College of Idaho, The Master’s College, UAA College of Engineering, Universal Technical Institute, University of Alaska – Anchorage, University of Alaska – Fairbanks, University of Alaska – Southeast, University of Hawaii at Manoa, University of Idaho, University of Portland, and Willamette University. This entry was posted on March 3, 2015 at 10:21 pm. You can follow any responses to this entry through the RSS 2.0 feed. You can leave a response, or trackback from your own site.